After all that Raya feasting, it’s time to get back on the wagon! We know how stressful healthy eating can get. So, we’ve shortlisted these Top 10 Healthy Lunch Ideas along with the approximate caloric values and pricing to help you out. A relatively new contender in town, Sandwich Express serves up a variety of yummy sandwiches and healthy salad boxes. If you’re not a fan of bread, we’d highly recommend their croissants as well, which goes perfectly with chicken slice or egg mayo. Top it off with your choice of fresh vegetables like lettuce, capsicum, cucumber, tomato, and add a drizzle of BBQ, garlic or roasted sesame sauces. Sandwiches are toasted to a slight crisp and best eaten while hot! If you’re on a low carb diet, their sandwiches can be served as salads and topped with raisins and walnuts for that extra boost of nutrition. Sandwich Express is located @ F1.58. 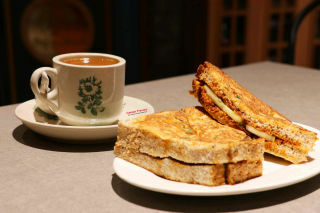 Prices start from RM6.99 for Sandwich of the Day. What, exactly, is poké? Originating from Hawaii, poké is a raw fish salad that is traditionally served as an appetiser or sometimes as a main course. We like how the bowls are filled with guilt-free healthy ingredients like fresh veggies, nuts, fruits, topped with raw cubed fish for a boost of protein. And what’s cool – you get to be the boss of your own poké bowl! You can build your own bowl from scratch by selecting your preferred base (white rice, brown rice or salad), main poke (fresh salmon, tuna, shrimp or octopus), sides (carrots, cucumbers, edamame, almonds and much more), sauces (avocado, kimchi, sesame, etc) and toppings (fried garlic, chilli flakes, ebiko, furikake, etc). Poké Bear is located @ LG1.110. Prices start from RM15 for a wrap and RM18 for a bowl. Pommes Frites is known for Belgian fries and pasta – but if you’re looking for a healthier option, their salads and grilled meats are definitely worth checking out. We’d highly recommend their Chef’s Salad which comes with mixed greens, a generous serving of bbq chicken fillets, feta cheese and garlic bread with balsamico dressing. For a saltier option, their Nicoise Salad packs a punch with lettuce, tomato, cucumber, bell pepper, egg, tuna, olives, anchovies and onions, served with French dressing. If you can’t live without meat, try their Roasted Chicken or Tarragon Chicken and swap the Belgian fries for salad. Pommes Frites is located @ F1.AV.196. Prices start from RM13.90 for a salad and RM16.90 for chicken. Yes, healthy eating can be tasty too! Load up on protein with Nando’s flavourful grilled chicken (skip the peri chips and wedges!) in 1/4 chicken, 1/2 chicken or butterfly chicken breast varieties. You can also opt for their Algarve Salad, Mediterranean Salad or Wraps to get your fill of nutritious veggies. Nando’s is located @ LG2.56. Prices start from RM17.90 for 1/4 chicken with 1 side and RM19.90 for chicken butterfly with 1 side. Prices for wraps start from RM14.90, salads at RM13.90. Caloric value (estimated): between 36 – 100kcal for a salad / 300-400kcal for a wrap / 300 – 500kcal for a chicken meal. Have…you met the Low Carb Carl’s Jr’s Burger? Yes, you read that right. Instead of buns, the burger is wrapped in fresh iceberg lettuce! Simply choose your preferred burger and request for a low carb version. You’d get to enjoy the burger in all it’s char-grilled glory, sans the carbs. Another option would be their crispy chicken salad which comes topped with chicken strips, a mound of fresh lettuce, tomatoes and onions. Carl’s Jr is located @ LG2.121. Prices start from RM9.80 for a sandwich (without sides), RM13.80 for a salad. Caloric value (estimated): between 250 – 350kcal for a low carb burger and 293kcal for a salad. For days where you’d need to eat and run, Subway would be your best bet. Simply convert any of their sandwiches into a salad and you’ll get a generous portion of fresh vegetables, protein and choice of sauces. Subway is located @ LG2.79. Caloric value (estimated): between 200 – 360kcal for a salad. Less fat, less salt, less calories…a whiff of Kenny Rogers Roasters’ roasted chicken will have you salivating! For health junkies, Kenny’s Quarter Lite Meal is right up your alley. The meal comes with a 1/4 roasted chicken, 1 side and 1 Kenny’s Home-Made Muffin. If you can’t decide on 1 side, go for Kenny’s Quarter Meal which comes with 3 sides and 1 Kenny’s Home Made Muffin. Kenny Rogers Roasters is located @ LG2.96. Prices start from RM17.90 for a Quarter Lite Meal & RM21.90 for a Quarter Meal. Caloric value (estimated): between 600 – 800kcal for a Quarter Lite Meal and 800 – 1,200 kcal for a Quarter Meal. 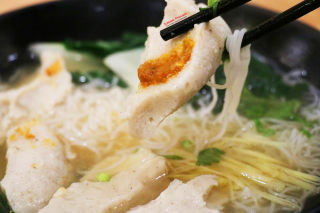 Take a bite of this crunchy, warm popiah! Each popiah is made with fresh cucumber, boiled turnip, carrots and crunchy biscuits. 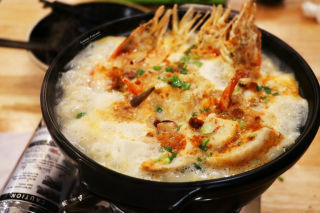 You can opt for additional fillings like prawn, chicken & cheese and crabstick. Since most of the ingredients are boiled, popiahs contain less fat and calories, which makes it the perfect tea time snack. Sisters Crispy Popiah is located @ LG2.31. Prices start from RM3.80 for 1 roll and RM7.20 for 2 rolls. Caloric value (estimated): 188kcal per roll. If you’re craving for a filling meal without the guilt of indulgence, try the Vegetarian Menu at BMS Organics, which features our local favourites like Hakka Lei Cha, Nasi Lemak, Chilli Pan Mee and even Western fare such as Aglio-Olio and Chickpea Burger. BMS Organics replaces white rice with multi-grain rice for an added boost of nutrition and fibre, and regular noodles are replaced with handmade noodles. Instead of meat, BMS uses tofu and organic greens. For those on a gluten-free diet, dig into the Summer Grain Quinoa salad, made with organic quinoa, berries, nuts and fresh vegetables, tossed with a homemade garlic aioli dressing. BMS Organics is located inside AEON, near the Orange Concourse. Prices start from RM13.90 for Signature Nasi Lemak. Caloric value (estimated): 300 – 600kcal per meal. Another guilt-free option, Simple Life, offers loads of options in their menu. 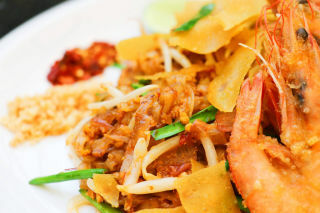 Rice lovers can satisfy their cravings with various types of multi-grain fried rice or nasi lemak, while noodle-holics are spoilt for choice with nutrient-rich bowls of brown rice mee sua, bee hoon or ramen. We love their salads which come with a generous serving of fruit (dragonfruit, almond or mango). Complement your meal with some calming osmanthus tea or fruit tea. Simple Life is located at LG2.126. Caloric value (estimated): 400 – 700kcal per meal. Go forth & be healthy! *Prices are accurate at publishing time & subject to change.